Someone forgot to tell Martin Truex Jr. it's a two-man race to Homestead. The driver of the No. 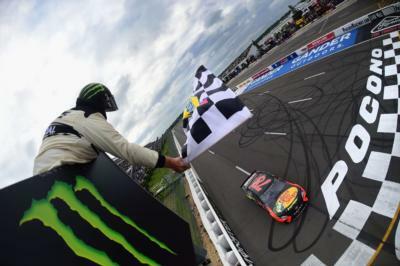 78 Toyota reminded everyone why he's the reigning champion by holding off Kevin Harvick, Kyle Larson and Kyle Busch to win Sunday's Pocono 400 at Pocono Raceway. "We decided to stay out there when some guys pitted. Like four of us stayed out or whatever. But yeah, really, we were good on scuffs yesterday in practice, and that kind of led to that decision, and Cole said stay out, and I was like, 'I think this is a good idea.' So luckily it worked out for us," Truex said. Truex now has 13 playoff points, good enough for third-most behind Busch and Harvick's 25, and he's fourth in the overall standings. Over the last three points races, Truex has shown flashes of his 2017 dominance, finishing second twice before winning Sunday. Pocono was also home to Truex's first win with Furniture Row Racing in 2015. Since then, he's visited victory lane 14 times with the Denver, Colorado-based team. How Truex won the race: Kyle Busch appeared poised to return to victory lane when a yellow flag waved for debris in Turn 1 on Lap 140. Cole Pearn chose to keep Truex on the track, hoping that clean air would make up for slightly older tires on his machine. Pearn proved prescient as Truex was able to hold off Harvick and Kyle Larson over several late-race restarts and cruised to the victory. "It was an at-a-moment decision," Pearn said. "It was just win, one side or the other, it was pretty much a coin flip, really, when it came down to it. If we were running second at the time, leading, it's a tougher decision, I think and once the 18 ducked off, made the call to stay. Just thought our best odds was to do something different, and obviously it worked out." The Big Three: Entering Sunday's race, a lot of chatter was simply about which driver would join Busch, Harvick and Truex in the championship four at Homestead. Exiting the Pocono 400, we're in the same position as they combined to lead 133 of 160 laps Sunday afternoon. In fact, over the last 24 races, those three have combined to win an astounding 19 times, including 11 of 14 races this season. The only other drivers to visit victory lane over that span: Clint Bowyer, Austin Dillon, Matt Kenseth, Brad Keselowski, and Joey Logano, all with one win each. Cautions breed cautions: It sounds cliche, but it's true. Through 125 laps, Sunday's race was slowed just twice, both for stage breaks. But after the field went green in the final frame, things got crazy in the Poconos. There were four cautions in the final 60 laps, including a multi-car incident that took out four-time Pocono winner Denny Hamlin. With restarts giving drivers the opportunity to pick up several positions quickly, it should be no surprise that disaster strikes, especially at a track like Pocono, where drivers often spread out to four- and five-wide on the massive frontstretch. Harvick bounces back: After finishing last for the first time in his Cup Series career in the Coca-Cola 600, things returned to normal for Kevin Harvick. The 2014 champion led a race-high 89 laps and had the fastest car for most of Sunday's 400-mile race. Unfortunately for Harvick, he was beaten off pit road by Kyle Busch and never regained the lead. Harvick attributed it to losing control of the restarts and being stuck in the less-effective inside lane. "We lost control of the race when we didn't come off pit road first," Harvick told FOX after the race. "They didn't do anything wrong, we just didn't come out first. You win some, you lose some. When you're racing against guys like that, it's going to come down to splitting hairs and the 78 and 18 were really good today." After finishing fourth, crew chief Rodney Childers defended the decision to stay out with Truex when several others pitted. Childers tweeted that tires didn't help the 78 win and that "clean air still wins, every time." Pit strategy burns Busch: Kyle Busch ran in the top five for virtually all of Sunday's race, but a decision to pit in the closing laps left him wondering what might've been at Pocono. Adam Stevens called his driver in for four fresh tires, thinking with nearly 30 laps to go, Busch could drive through the field and retake the lead. That didn't quite work out, as Busch quickly got to third, but his progress was stalled and he couldn't catch Larson or Truex ahead of him. After the race, Busch said the decision to pit proved to be the wrong one, much like staying out in a similar scenario last year at Pocono. "We lost this race last year on not pitting in that situation and getting beat by tires, and so we pitted this year for tires and got beat by those that didn't pit," Busch said. "Just a really crazy situation there with how all that kind of transpired and went down, but we fought hard for the finish and tried to get the most out of what we could there and just couldn't pass." Pocono proves aero isn't easy to fix: After seeing a very competitive race at Indianapolis Motor Speedway in the Xfinity Series last year, NASCAR decided to bring that same aero package to Pocono for Saturday's NXS race. But things didn't go exactly as planned, as Kyle Busch was able to keep the field at bay while in the lead and went on to win by 2.3 seconds. Following the race, several drivers complained about not being able to get enough of a run on the lead car due to restricted power. Disappointing day today. Not enough cornering ability to make the package work through 1 and 3. Was worth a shot. We';ll make it up to you at Michigan next week. The package is basically the same as the package used in the All-Star Race in the Cup Series, but Pocono presented some challenges for the configuration. The rules setup will get another test this weekend at Michigan, where high banks and a wide racing groove should provide the conditions necessary for a thrilling race throughout the field. And speaking of the Cup Series rule package, NASCAR's Steve O'Donnell said Saturday the sanctioning body was looking at "two or three" events to test the special aero setup later this season. Officials with Indianapolis have gone on record saying they'd welcome the rules package, and it wouldn't be a total surprise if Kentucky Speedway was used as a test at another 1.5-mile speedway before the playoffs. Social spotlight: For the second week in a row, Bubba Wallace gets our social media spotlight recognition. After dropping out of the race with an engine failure caused by a missed shift on a late restart, Bubba tweeted that he drew the ire of The King, which is something you never want to do. "We're gonna get you an automatic transmission hahaha"
Keep your chin up, Bubba, better days are surely ahead for you. By the way, happy anniversary. It's been quite the year since you made your debut in the Cup Series. Bloomin' Monday: A fourth-place finish at Pocono by Kevin Harvick means a win for you! Race on into an Outback Steakhouse Monday and tell your server you're there for Bloomin' Monday and they'll bring your table a delicious shareable Bloomin' Onion for free! Next week: The Irish Hills of Michigan will play host to its first of two NASCAR weekends with the Firekeepers Casino 400 and LTi Printing 250 Xfinity Series race. Manufacturer pride is always on the line outside the Motor City, and Kyle Larson's going for four in a row at MIS. Will he break back into victory lane and punch his playoff ticket? Catch all of the action from Michigan on the Motor Racing Network and Fox Sports 1.